We adore this unique modern spin on a beloved vintage style! 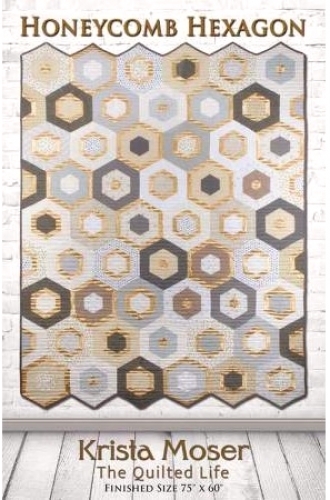 The nostalgia of Grandmother's Flower Garden hexagon makes a fresh comeback in luminous gold, grey and white. Incorporate your favorite jelly roll or raid your stash. You can work with as little as a 5" strip of each color. Accent your room with a clever contemporary quilt that will complement today's chic decor. Hexagons quilts are all the rage right now. Have you ever wanted to try one but have heard they are hard? Then, you will love this pattern! It's entirely strip pieced so no fussing with Y-seams or difficult piecing techniques. You get a WOW effect without all the headaches. Intermediate Skill Level. Finished size: 75" x 60"